Firefly: The Complete Series Just $15 Down From $90! You are here: Home / Great Deals / Amazon Deals / Firefly: The Complete Series [Blu-ray] Just $15 Down From $90! Firefly: The Complete Series [Blu-ray] Just $15 Down From $90! 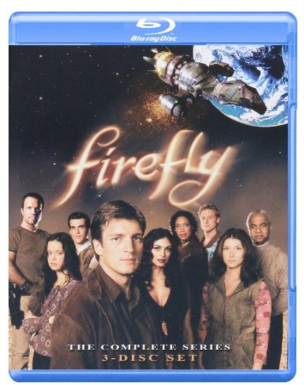 Head over to Amazon and score this fantastic deal on Firefly: The Complete Series [Blu-ray] for just $15 down from $90! Get yours now while it lasts! Five hundred years in the future, there’s a whole new frontier, and a crew of the Firefly-class spaceship Serenity is eager to stake a claim on the action. They’ll take any job, legal or illegal, to keep fuel in the tanks and food on the table. But things get a bit more complicated after they take on a passenger wanted by the new totalitarian Alliance regime. Now they find themselves on the run, desperate to steer clear of Alliance ships and the flesh-eating Reavers who live on the fringes of space.